Theatre World Award Winner & Star of Broadway’s On Your Feet! WP’s Annual Gala celebrates truly outstanding women who have taken risks, pushed limits, and broken ground in a wide variety of fields. This year, we are pleased to honor leaders committed to advancing women’s narratives and to sharing women’s voices on stage, in film and on television. WP is thrilled to count these women as allies in our mission to develop, produce, and promote the work of female-identified artists at every stage in their careers. For more information click here. DEBRA MESSING is best known for her role on NBC’s Emmy Award-winning and Golden Globe-nominated comedy series Will & Grace. This January, NBC ordered ten episodes of a Will & Grace revival with the entire original creative team, which is scheduled to air during the 2017-18 television season. Most recently, Messing starred in the NBC series The Mysteries of Laura, which premiered in 2014. In 2012 and 2013, Messing starred as Julia Houston in NBC’s Smash, a musical drama about the creation of a new Broadway show. In 2014, Messing made her own Broadway debut in the Tony Award-nominated production of John Patrick Shanley’s Outside Mullingar. Other theater credits include Donald Marguiles’ Pulitzer Prize finalist Collected Stories, and Paul Rudnick’s Off-Broadway play The Naked Truth. Messing’s film work includes the box office hit Along Came Polly and The Wedding Date. Messing starred in The Women and the family comedy, Nothing Like The Holidays. She also co-starred in Woody Allen’s Hollywood Ending, and The Mothman Prophecies. Messing won a Best Featured Actress Award for her work in the 2015 Indie drama Like Sunday Like Rain. In 2017, Messing will star as Marjorie Houseman in ABC’s three-hour remake of Dirty Dancing, premiering May 24th. Messing is the Global Health Ambassador for Population Services International (PSI) focusing on HIV/AIDS. She has traveled extensively in Africa in this role and in 2010 testified before the House Foreign Affairs sub-committee on Africa and Global Health. She was also a key speaker at the 2012 AIDS conference in DC. Other charities Messing supports include HRC (Human Rights Campaign), Everytown for Gun Safety, and Joyful Heart Foundation. She was honored with The Trevor Life Award for her contributions to the LGBT community. Messing attended Brandeis University and received her MFA from NYU. She resides in New York. As President, BBC Worldwide North America, Ann Sarnoff is responsible for leading the company’s businesses in the U.S. and Canada which includes two studios—BBC Worldwide Productions, producers of the smash hit “Dancing with the Stars” and drama series “The Night Of,” and Adjacent Productions—linear and digital program sales, home entertainment, licensing, live events, and e-commerce. She also oversees the amplification of BBC Worldwide’s global brands “Doctor Who,” “Top Gear,” and natural history brand BBC Earth. Prior to BBC Worldwide, Sarnoff was President of Dow Jones Ventures and Senior Vice President of Strategy, where she was responsible for leveraging the assets of Dow Jones to create new businesses, while overseeing corporate strategy and business development. Before that, she was COO for the Women’s National Basketball Association, during which she helped to rebrand and expand the league. Sarnoff also spent ten years at Viacom, where she was Nickelodeon’s Executive Vice President for Consumer Products and Business Development, and subsequently became COO for VH1 and CMT. While at Viacom, Sarnoff helped launch new cable channels TV Land, Noggin, and VH1 Classic, and built Nickelodeon consumer products into a multi-billion-dollar business at retail. Sarnoff sits on the board of HSN, Inc., a $3B interactive multi-channel retailer, and recently joined the board of Georgetown University. She is the Vice President of The Women’s Forum of New York and the Vice-Chair of the advisory board of the McDonough School of Business. She also serves on the board of the Harvard Business School Women’s Association of New York, the advisory board of British American Business, the Digital Task Force for New York Public Radio, and is a former board member of ART:21. For the past six years, Sarnoff has been named one of the Most Powerful Women in Cable by CableFAX Magazine. THE BENGSONS Married duo The Bengsons have appeared across the country and around the world at such venues as Joe’s Pub (NYC), NYU’s Skirball Center (NYC), MASS MoCA (North Adams, MA), On The Boards (Seattle), FlynnSpace (Burlington, VT), and the Market Theater (Johannesburg, South Africa). Their indie folk opera, Hundred Days (Z Space, San Francisco; Know Theatre, Cincinnati) was awarded the TBA Award for Best New Musical. They have had three singles featured on national television on “So You Think You Can Dance” (FOX). Most recently their music was featured in Anne Washburn and Rachel Chavkin’s Iphigenia in Aulis at Classic Stage Company. They are founding members of the Real Make Collective with Sonya Tayeh and Jo Lampert. Abigail Nessen Bengson has toured as a member of tUnE-yArDs, including an appearance on “Late Night with Jimmy Fallon.” Upcoming works include commissions with Ars Nova & WP’s Sundown, Yellow Moon and New York Live Arts. CHRISTINA BIANCO Two-time Drama Desk Award nominated actress, singer and impressionist Christina Bianco has become a YouTube sensation with her diva impression videos. A woman of a thousand versatile voices, Christina has gained 23 million views worldwide, leading to performances on major television programs such as “The Ellen Degeneres Show” and “The Today Show”. West End: The Menier Chocolate Factory’s hailed production of Forbidden Broadway. New York credits include: The Marvelous Wonderettes, Application Pending (Drama Desk Award Nomination), Newsical the Musical, Forbidden Broadway; Goes To Rehab (Drama Desk Award Nomination), Raffi On Broadway at the Gershwin Theatre, Tony and Tina’s Wedding (Tina) and It Must Be Him. Christina originated the role of Dora in the long-running National Tour of Dora The Explorer Live, including a sold-out run at Radio City Music Hall. TV credits include “Impress Me”, ‘Signed, Sealed, Delivered’ and VH1’s ‘I Love The 2000’s’. As a cabaret artist, Christina performed weekly in an unprecedented eight-month run of 11 O’Clock Numbers at Feinstein’s at Loew’s Regency in New York City. She has performed her critically acclaimed solo shows, Diva Moments and Party Of One, to sold out crowds at NYC’s Birdland and regionally across the U.S. Abroad, Christina has sold out extended runs headlining at London’s famed Hippodrome, Royal Albert Hall’s prestigious Elgar Room and at the Edinburgh Fringe Festival. KATE LEAR is a writer, theater producer and philanthropist. As a Trustee of the Frances Lear Foundation, she supports work in the areas of the arts, the environment and juvenile justice. She is the proud board chair of Ballet Hispanico of New York and a member of the Committee for the Jerome Robbins Dance Division at the New York Public Library. KATHY NAJIMY is an actor, director, writer, producer, and activist known for her memorable performances in over 25 films and over 100 television projects. Najimy is very proud to have been named Ms. Magazine Woman of the Year and The NY Lilly Award for Actress/Activist of the Year 2016. Najimy is internationally known for her award-winning portrayal of “Sister Mary Patrick” in the Sister Act films, Hocus Pocus, Rat Race, Pixar’s Oscar and Golden Globe winning WALL-E, Madea Christmas, Say Uncle, Hope Floats, Zack and Reba, Soapdish, The Hard Way, The Wedding Planner, The Guilt Trip with Barbra Streisand and more. Najimy starred as a series regular on A&E’s cop show, Unforgettable as the Captain of NYPD Major Crimes. She currently frequents the TV show “Younger” and HBO’s Multi Emmy Award winning “Veep” as Wendy. She voiced Peggy Hill for fourteen seasons on the Emmy Award-winning “King of the Hill” for which she received several awards and starred as Olive on NBC’s “Veronica’s Closet” for 3 seasons with Kirstie Alley. In addition, she has appeared on several television shows such as: “ELLEN,” “Desperate Housewives,” “Ugly Betty,” “Elementary,” “Graves,” “Cinderelmo”, “Drop Dead DIVA,” “Make It or Break It,” “The Big C,” “Numb3rs,” “Chicago Hope” and a gazillion cartoons. Najimy wrote and starred in The Kathy and Mo Show, with Mo Gaffney, her long-running feminist comedy off-Broadway play, which became two award-winning hit HBO specials. Kathy co-created and directed the acclaimed off-Broadway hit Back to Bacharach and David, directed and co-wrote These Girls with Olivia Wilde, Chelsea Handler, Zosia Mamet, Amy Schumer, Debra Messing, Amy Poehler, Rashida Jones, Gabby Sidibe, Debra Messing and Rosie Perez~~ and has helmed several other stage projects. In the theater, Najimy starred as the legendary Mae West in the hit Broadway play Dirty Blonde, and later at The Old Globe Theatre (Outer Critics Circle Best Actress). As a proud feminist and social justice advocate, Najimy has been recognized with numerous honors for her enthusiastic work supporting women’s, girls and LGBT rights, AIDS, animal rights, and reproductive rights. She frequently travels the country as a keynote speaker on these issues. She was thrilled to be surrogate speaker on behalf of Hillary Clinton. She is currently helping give voice to the movement to reverse the ban on Immigrants, preserve reproductive rights, abolish the NYC carriage horses, and reintroduce the ERA. She has won over $300,000 dollars on game shows (her obsession) for her charitable foundations. Kathy lives in NYC with her husband Dan Finnerty of The Dan Band and their daughter, singer/songwriter/actor, Samia. WP Theater’s 31st Annual Women of Achievement Awards Gala took place June 13, 2016 at the Edison Ballroom. 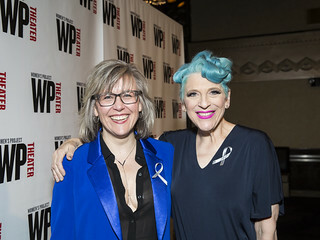 The evening, which was hosted by comedian and playwright Lisa Lampanelli (#StuffedPlay), honored Emmy Award winning actress and activist Martha Plimpton; film, television, and Broadway producer Jenna Segal; and actress, producer, environmentalist, and UNICEF ambassador Trudie Styler.